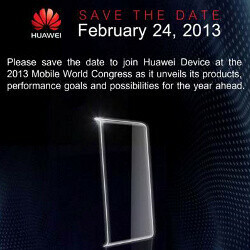 Huawei sends out press invites for MWC: could we see an octa-core Ascend P2? Huawei has sent out invites for its press event on February 24th at Mobile World Congress and it is teasing the unveiling of new products, goals and possibilities. After a strong CES appearance with its 6.1-inch Ascend Mate and the 1080p 5-inch Ascend D2, Huawei could treat us to an octa-core Ascend P2 if rumors are to be believed. This suggested upcoming device would also manage to retain a very thin body. We don’t know much about the possibility of an octa-core setup. It is possible that it uses a big.LITTLE or similar layout where four power-efficient cores (like the A7) are combined with four performance cores (A15), to technically arrive at the octa-core name. In either case, Huawei has grown to become the world’s third largest smartphone maker in 2012, following Samsung and Apple, and that definitely means something. The company is still to become known in the States, and this Ascend P2 might be one step towards this. "It is possible that it uses a little.BIG or similar layout" Isn't it big.LITTLE? Yes it is. Btw, if they out this before the big dogs of Sammy they'll really get a lot of attention. Do we really need octa core devices? Not even mainsteam computers have octa cores. Heck, none of the Intel or AMD chips have 8 true cores. Unless maybe you are willing to pay $1000+ US. It's an attempt to have both performance and power savings. High end CPU's today aren't as concerned with power usage. Also, desktop CPU's have hyper threading. My opinion is that having 2 A15's and 2A7's should be great. I think they should be more focused on writing out the code better and forming the architecure more efficiently to get better battery life.